My Teflon website has been up for 7 years now since The Specials reformed and started touring again in 2009. It has been a celebration of all things 2 Tone and the small part of my involvement back in the day. I am pleased to have been at the start and concept of the Folkestone Skabour Festival with it’s success each year although it did go through some stormy waters, but is now on an even keel, with a great team of local ska, rocksteady and reggae luvvers (the Ska Co-op) and at its home of the Grand Burstin Hotel at Folkestone Harbour and as a community not-for-profit event. I have met some great new friends on this new 2 Tone adventure and greatly honoured to have designed again artworks for The Selecter. It has brought me the opportunities of new album sleeves to design and artwork for some of the great Jamaican singers, musicians and producers ie Bunny Striker Lee, Lee Scratch Perry, Yabby You, Horace Andy, Dennis Bovell etc for Pressure Sounds. But with the intervention of a few things this website will change or move on. There will be a gallery of all the related Teflon 2 Tone works I was in involved with that bring happy memories for all us along this journey from ‘79. I will be pleased also to discuss those works with your enquires. 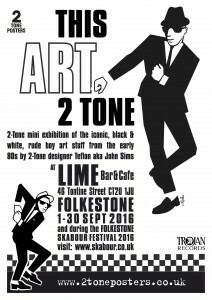 A small “This ART 2 Tone” exhibition can be seen at LIME Bar & Cafe, 42 Tontine Street, Folkestone CT20 1JU during September 1st till 30th. Visiting or passing through Folkestone, Channel Tunnel or at SKABOUR drop in and don’t miss. Folkestone Skabour Festival is on weekend of 16th, 17th & 18th of SEPTEMBER 2016. This year sees Dave Wakeling with ENGLISH BEAT, THE SKINTS, RHODA DAKAR sings The Bodysnatchers, THE DUALERS, MACKA B and many more. Plus 3o DJs and Trevor Evans aka ET Rockers as MC. 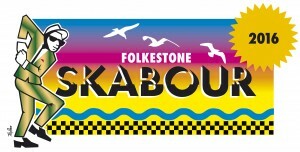 There is a Skabour package deal at the main venue and stage of the Grand Burstin Hotel at The Harbour, Folkestone. Plus FREE community marquees, scooter ska park and DJ stage 2 Lounge. As usual SUN, SEA &.. SKA! Skabour is a not-for-proft community festival organised and run by the local Ska Co-op team of ska, rocksteady and reggae luvvers. You are currently browsing the classic 2-tone graphics news archives for August, 2016.